I’d been wanting to shoot here for some time. 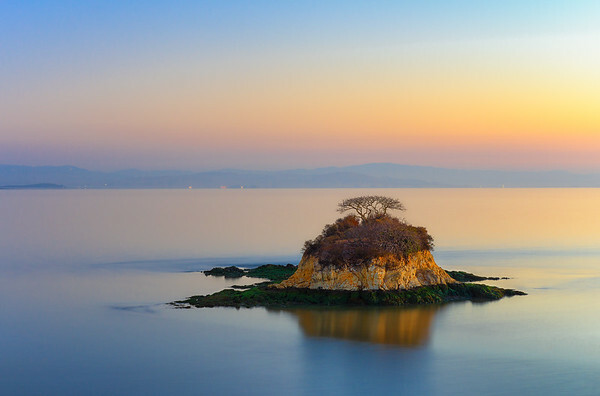 Like Bonsai Rock at Lake Tahoe, there’s something about a solitary rock with little trees that intrigues me. On this morning there were no spectacular conditions presenting themselves, but when I came over the hill and saw the simplicity of the scene, I knew it was good enough. In the pre dawn light, pastel colors overcame the gray, and the still water around the island provided a nice reflection. This shot reminds me in the absence of drama, there remains a quiet and calming peace equally as attractive as a fiery sunset.